I never really got into the Angry Birds franchise for one reason or another. They're decent enough games but I guess physics simulators just never really drew me in from a gaming perspective. I'm more of a puzzle / strategy kind of guy when it comes to the mobile market. And then Angry Birds Transformers was announced and I was rather skeptical about the game and I was very much prepared to hate it. But then the first trailer for the game came out, which was essentially the game's opening sequence, and I have to admit that I was now curious. And the whole 1980's treatment for things (including VHS tracking lines!) was an interesting decision. The actual game didn't feel like the other Angry Birds game and it certainly showed a lot of potential. But I've been playing the game for a while now and it has gotten rather bogged down in that black hole many freemium games setup. Such a shame really. 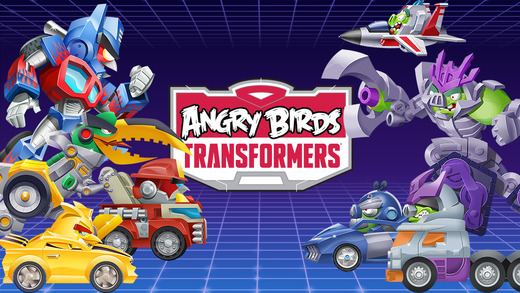 Synopsis: Angry Birds Transformers is a side-scrolling shooter game that retains a modest amount of the original physics element to the game but with a much greater focus on this whole combat engine. It is the tenth Angry Birds game released by Rovio and is available for iOS, Android, and Windows Phone. The game also features a tie-in line of toys. The game itself is free to download across all platforms. So the AllSpark seems to arrive on Earth as a giant egg, which turns both the Angry Birds and the Pigs into cybernetically enhanced robots that become the factions of the Autobirds and the Deceptihogs. But the two forces realize that they need to work together since the AllSpark egg has also created EggBots, which are slowly trying to turn all living things into Transformers-style life. The game mostly consists of you as the player resolving with different areas of the map where the EggBots have started the conversion process. Each area becomes a mission for a particular Transformer - and as a player you will have control of both Autobot and Deceptihog characters that will allow for more missions. At the beginning most of the island is hidden by clouds and over time you'll be able to reveal more parts of the map. Each Transformer has their own unique weapon-style that deals damage in different ways. You'll also unlock additional special attacks like EMP charges and airstrikes to help you defeat the EggBot forces, who are pretty much pigs as well. Every time you level up a character that merits you a star and the total number of stars determine when additional parts of the island now become available for unlocking through the use of coins. That brings us to the game's currency system. The coins are needed for unlocking more of the map and purchase character upgrades. But there are also crystals, which can be used to speed up upgrades or efforts by EggBots to digitize another part of the map. Thus in order to progress, you'll primarily need the coins, which you can earn from missions (by destroying objects) or by collecting them from liberated areas. Each area can store up to 400 coins that are earned over time thus you'll end up repeatedly logging into the game just to gather more coins. You also "spend" the pigs that you collect in order to liberate various Transformers around the map, thus giving you more characters to work with. The core gameplay is fun enough as your Transformer makes his way across the screen until he can get back safely into Astrotrain. You'll face all sorts of different pigs setup on different towers in the classic Angry Birds style and a few that flying around in a more dynamic manner. One tap on on a target will have your Transformer lock on and it will keep firing until the object (or pig) is destroyed. Destroying the metal shells that are covering different plants give you energon cubes, which power your special abilities. The main annoyance is the limited nature of coin generation. The various parts of the map do provide more and more coins, but the cap is always 400 credits per section. And when you look at the different Transformers, you'll find that the cost to upgrade them gets ridiculously high very fast. Each mission also has a difficulty rating and you'll quickly find that more and more missions are tagged as "Very Hard" which are almost impossible to complete, more often than not. Thus the game degenerates into a long sessions of waiting for more coins just to be able to have characters strong enough to complete a mission on Medium difficulty or something. As you get to around Level 40, the game seems to slow almost to a crawl unless you decide to actually purchase coins with real cash, but that's never a good decision in the mobile gaming sphere. The game also has a tie-in with physical toys called "Telepods" that you can import into the game via your mobile device's camera. It's supposed to be a more affordable way of bringing the characters into the game, assuming that you're more interested in saving time instead of money. The toys don't seem too remarkable as far as Transformers go, but I guess you need to have a gimmick. Angry Birds Transformers has a decent enough core game mechanic and a clever narrative style that is meant to inspire nostalgia among longtime Transformers fans. However the gameplay itself quickly becomes rather repetitive and the ridiculous upgrade costs means a lot of coin-collecting instead of grinding in battles. Thus the game only rates 2.5 1980's references inherent in the game out of a possible 5.